I know I've already written a post on decorating with maps a few months ago but I ran across this wallpaper from Cox & Cox today and needed to share it. I really like how the wallpaper takes on the curved appearance of a real globe. 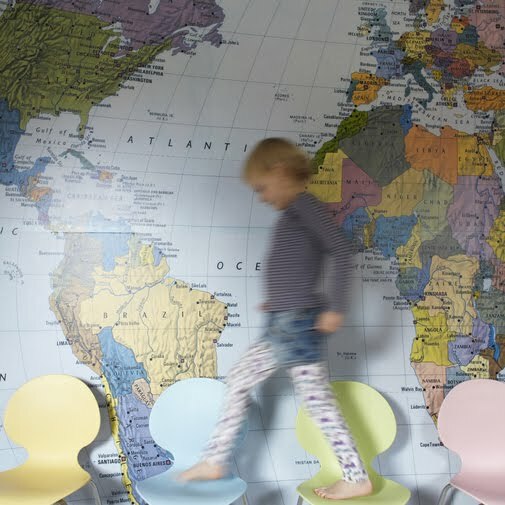 You can't use it on a really large wall but on a small blank wall in a child's room or playroom would look fabulous! 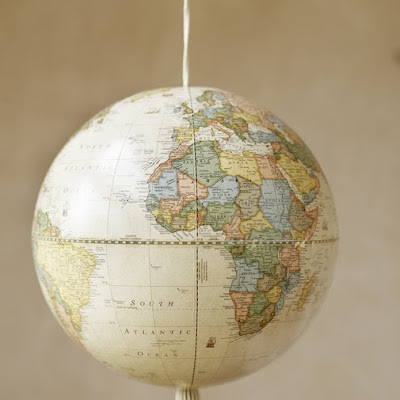 Ever thought of using a globe as a mobile? An interesting idea? love maps!!! Sometimes the world is soooo small!!!! Where can you get something like the nautical charts pictured in elle decor?? I love it. I love this. I wish we would have thought of this before we bought my daughter's bedding. كما نعمل باستمرارٌ على البحث الدائم في طريقة التداول مع الحشرات المنزلية حتى نصل لأعلى درجات العلم والمعرفة في ميدان مكافحة الحشرات المنزلية، ولدينا ايضاً من المبيدات أفضلها دولياٌ والحائز على قبول وزارة الصحة لأمانه على الحالة الصحية للإنسان والحيوانات الأليفة.